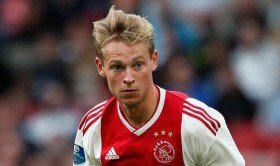 Premier League holders Manchester City are reportedly prepared to finalise a deal for Ajax midfielder Frenkie de Jong midway through the current campaign. The 21-year-old has been widely regarded as one of the Netherlands' best young prospects and his progress over the past year has attracted widespread European interest. Amidst this, Sport claims that the Citizens are aiming to get a head start ahead of their European rivals by agreeing on a winter deal for the versatile midfielder. The Mancunian giants are prepared to pay a club-record fee of nearly £70m for the Dutchman and they are willing to allow the youngster spend the remainder of the season with the Eredivisie outfit. Fernandinho has been Guardiola's prime pick for the holding midfielder duties over the past few years but the Spaniard is said to be agreeing a long-term replacement with the Brazilian already on the wrong side of 30. The veteran presently has just 20 months remaining on his existing contract and Manchester City are yet to open discussions over a new deal beyond that period.